Located 90 miles from the park entrance, Denali commands a chain of rugged peaks, each a marvel of ice and stone. 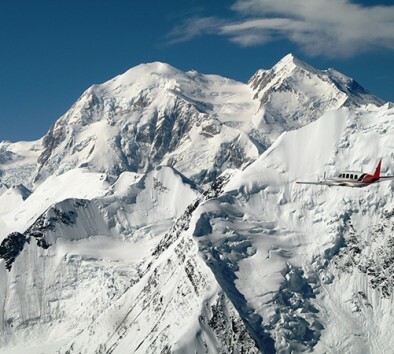 You will soar amongst the jagged mountaintops and over tumbling glaciers on a stunning 200-mile flight to get within ½ mile and circle Denali to see every spectacular corner of this massive mountain (weather permitting). This breathtaking flight will give you access to a remote corner of Alaska famous for its wild and majestic beauty. With the expert commentary of your experienced pilot, you’ll gain insight into Alaska’s grand mountaineering and aviation tradition. Let our highly experienced and knowledgeable pilots help you discover the highlight of your Alaskan vacation! Minimum age is 2. This tour is headset equipped, fully narrated and all seats are window seats. Precise flight routes are dictated by current weather conditions. Anticipated flight routes will be discussed with passengers during a pre-flight briefing. Flight time is approximately 1 hour.